I’m very happy to announce I have another amazing giveaway for Plastic free July. This giveaway was donated by the wonderful people of Go Bamboo. I LOVE Go Bamboo and have been buying their products for ages. Buying wooden products is one of the easiest ways to remove plastic from your home. 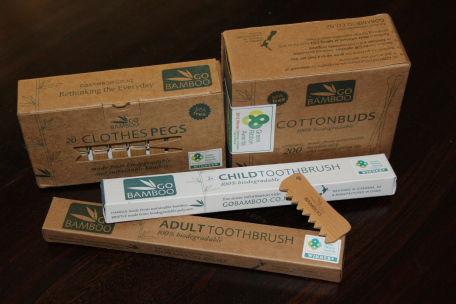 We save so much plastic entering and exiting our home by buying Go Bamboo products. I started with their toothbrushes these are fantastic at cleaning your teeth and even better you can put them in the garden or compost bin when you throw the brush away. One less plastic item in our household. I love their pegs and have bought several boxes since they started selling these. The newest item in their fantastic list of products is cotton ear buds. These are of course made of wonderful bamboo and cotton tips. I love that all these products are packaged in recycled cardboard that of course can be recycled again. I have two amazing packs to giveaway. The packs contain one adult and one child toothbrush, one pack of amazing pegs, one pack of cotton buds and a wax comb. Use the form below to enter to win one of these great prize packs. Open to New Zealand and Australia. Go Bamboo I love you. I love the look of this brand! I have not seen it before so thanks for sharing. Wow, the clothes pegs look extra neat. So great to know these kinds of product exist! These look lovely! Can’t wait to try them out. 30 million plastic ones end up in landfill every year. 30 million toothbrushes are thrown into landfills every year.